Uniqlo store in Beijing. Their expansion into China has been extremely successful. More stores slated for the USA. Photo by Reuters. In the wake of many teen retailers taking a beating, Fast Retailing Co., owners of the Japanese fast-fashion and technical brand, Uniqlo, announced an incredibly strong fiscal report today, January 8, 2015 with profits up 64% in the first quarter. Net income rose to 68.8 billion yen ($575 million) in the three months ended in November. Fast Retailing is headed up by Japan’s richest man, Tadashi Yanai, who predicted in October that net income may rise 34% to 100 billion yen for the year to August 2015, as it speeds up the Uniqlo chain’s overseas expansion. Yanai is also known for saying that Uniqlo would become bigger than Gap in the years to come. Based on our Youth Culture Studies, the brand is well on its way especially as it continues to expand in the United States. Young people have been naming Uniqlo as a favorite brand and store in increasing percentages, just a teen retailers such as Abercrombie & Fitch are declining as preferred brands among today’s youth market. Same store sales expanded 7.5% year-on-year. Sales of Fall, Winter ranges got an early boost when the weather turned cooler in September, with strong sales of core Winter items: HEATTECH, Ultra Light Down, and Extra Fine Merino. UNIQLO International reported impressive gains in revenue and profit, thanks to stronger than expected performances from Greater China (Mainland China, Hong Kong, and Taiwan) and South Korea. The network of UNIQLO international expanded by a net 62 stores, to 695 stores at the end of November 2014. Global Brands reported rising revenue and profit in the first quarter, as expected. GU performed to plan, generating double digit rises in both revenue and profit, while Theory reported slightly higher than expected gains in both measures. UNIQLO Japan achieved higher than expected gains in revenue and profit in the three months from September to November 2014. Revenue rose to ¥232.6 billion (+11.6% year-on-year), and operating profit expanded to ¥51.1 billion (+21.3% year-on-year). Operating profit rose strongly on the back of a 7.5% increase in same store sales, and higher gross profit margins. The gross profit to net sales margin improved by 2.4 points in the first quarter thanks to the strong overall sales trend. Sales of Fall, Winter ranges got an early boost when the weather turned cooler in September, and the subsequent strong performance of core Winter item ranges, such as HEATTECH, Ultra Light Down, and Extra Fine Merino, helped boost the gross profit margin. UNIQLO Japan opened the global hotspot store, UNIQLO Kichijoji, on October 3, 2014 and the global flagship store, UNIQLO OSAKA, on October 31, 2014. Both of these important new community-focused stores have proved extremely successful so far. The number of directly run UNIQLO Japan stores, excluding 28 franchise outlets, totaled 824 stores at the end of November 2014. While that is a net decrease of 14 stores year-on-year, nine of these stores were converted from directly run stores to employee franchise outlets. 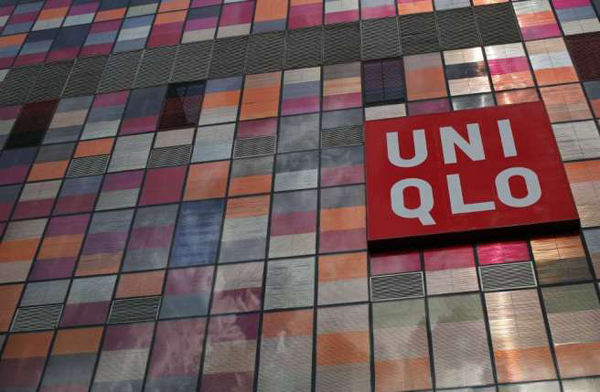 Within the UNIQLO International framework, Greater China (Mainland China, Hong Kong, and Taiwan) and South Korea reported higher than expected, strong gains in revenue and profit. UNIQLO Southeast Asia and Oceania generated rising revenue and profit in line with our expectations, while UNIQLO USA fell short of plan, to report a contraction in profit. UNIQLO Europe, including operations in the United Kingdom, France, Russia, and Germany, reported slightly lower than expected gains in revenue and profit, with profit at the same level year-on-year.